The season is a little more than halfway over, and we've already exceeded our record for treating the most sea turtles in a cold-stun season. 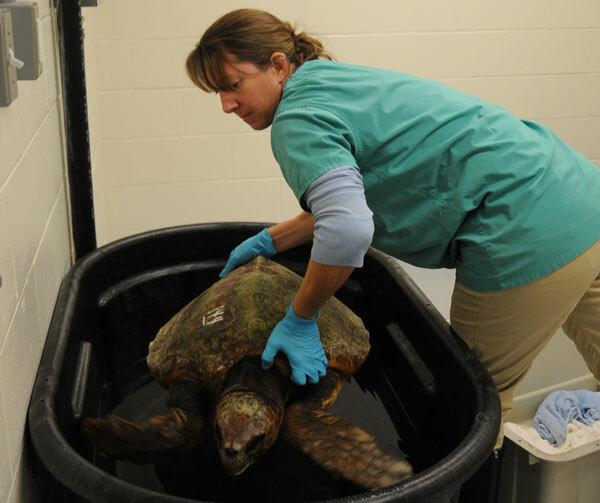 As of this week, nearly 150 turtles have passed through the Aquarium's Animal Care Center in Quincy. In addition to the sheer volume of sea turtles, we're also coping with an unusually high number of hefty loggerhead sea turtles. We usually see maybe a half-dozen loggerheads in a year. This year we've already seen almost five times that many. These turtles take up more space than their smaller cousins, and many have been transported to other rehabilitation facilities once they're healthy enough to travel so we can make room for the turtles that seem to be arriving every day. So far, we've seen 26 loggerhead, 13 green and well over 100 Kemp's ridley sea turtles. 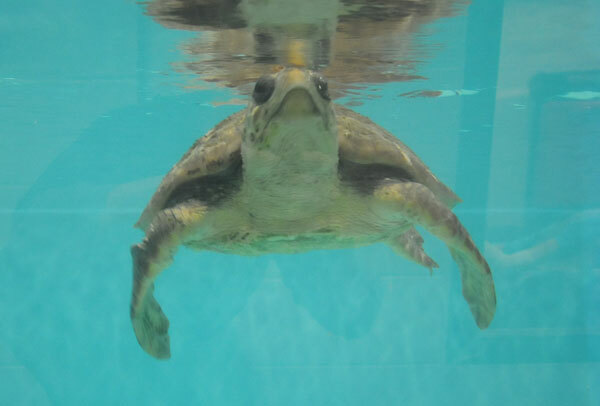 The Aquarium has treated around one thousand critically endangered Kemp's ridley sea turtles since the Marine Animal Rescue Team started treating turtles. There are an estimated 10 thousand adult Kemp's ridley turtles in the wild today. We could not work to save these endangered sea turtles without the help of volunteers, donors and our rescue partners—especially our friends at the Massachusetts Audubon Sanctuary at Wellfleet Bay. Mass. Audubon organizes fleets of volunteers to walk the beaches at all hours of the night and day looking for sea turtles. 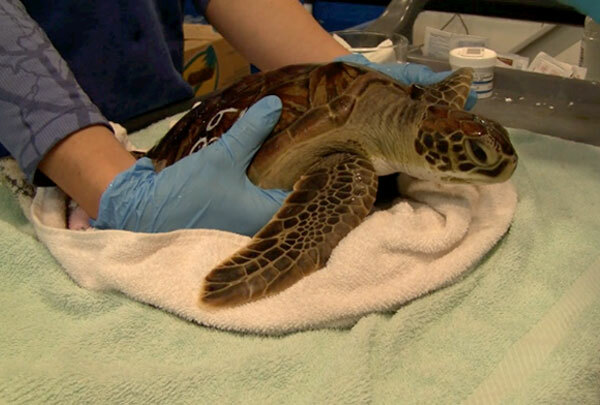 It's a race against time to find these turtles, and then there's the long road to recovery. And here's why we're doing it. Needless to say, we're incredibly busy. There's a lot of exciting stuff to share and we'll get it on the blogs just as soon as we can. Lots more thank yous and pictures and videos and stories of sea turtle heroics to come. Stay tuned! Support the Aquarium and efforts to save and protect endangered species. What is happening to these turtles to be in need of rescue? sorry I am such clueless. Thank you for the answer. I am not born in Massachusetts and I did not know about this problem. I will never say again that the ticket to visit the aquarium is expensive, I did not realize all the work you were doing! These species of sea turtles typically migrate up to northern Atlantic waters to feed in the summer months. Lots of yummy crustaceans and seaweed in Cape Cod Bay. As the season changes to fall and winter, the juvenile sea turtles aren't familiar with the migration routes and seasonal changes. They stick around in the Bay too long, the water gets cold, and they don't know that they have to swim north quite a ways then east to swim around Cape Cod. So they get too cold to have enough energy to swim into the current in the Bay, and swim in a southern direction... so they wash up on the north shore of the "inner" Cape. The winter temps are too cold for these reptiles. Volunteers patrol the beaches to find the cold-stunned turtles. I'm a member of the Aquarium, and I live in MA. I've visited the rehab facility in Quincy, it's terrific. It's mostly staffed by volunteers, and they always need donations to cover the expenses. Thank you for doing this. I am a member and it warms my heart to know that you are involved in this work. Are you accepting/in need of any more turtle volunteers? Wow! 26 loggerheads and 13 greens? I bet you're all staying very busy!! Wish I could be there to help out again this year! Wishing you guys all the best! So sorry I am missing this season! Hopefully I will be back to help soon. Miss you all.